This letter is to Speaker Pelosi directly. 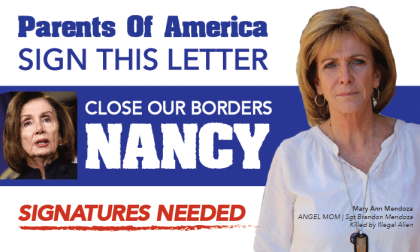 Our open borders have killed, maimed, addicted, and permanently separated countless Americans. If you care about women, you would close our borders. If you care about children, you would close our borders. If you care about the identity theft crisis rendering thousands of Americans homeless, you would close our borders. If you care about stopping our Opioid crisis, you would close our borders. If you cared. You would close our borders. Speaker Pelosi, this is a letter to you, as a parent, as a mother. We have had enough. Protect the people you swore to represent. Protect our children. Protect our future. WE WANT A WALL. WE WANT IT NOW.